Set the mood for your celebration with the perfect invitations! Whether you're looking for wedding invitations or baby shower invitations, the style of invitation you choose says so much more than you realize. The invitation wording might list all the important details but the style of the invitation gives guests insight into what kind of celebration to expect, how to dress and what kind of gifts (if any) to bring. 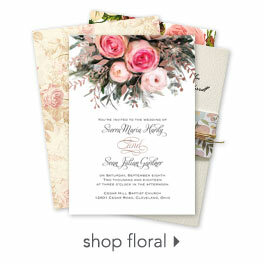 Shop our many invitation collections and enjoy a variety of designs. If you're having trouble finding exactly what you're looking for, visit our other brands for more options. Meet our family to learn more about each brand and to see what each of us can offer you.